When Nancy’s dad passed away, they sold the house in Mexico and used the money to build the ADU, which enabled them to create it without incurring any debt. The building contract for the ADU was approximately $137,000. 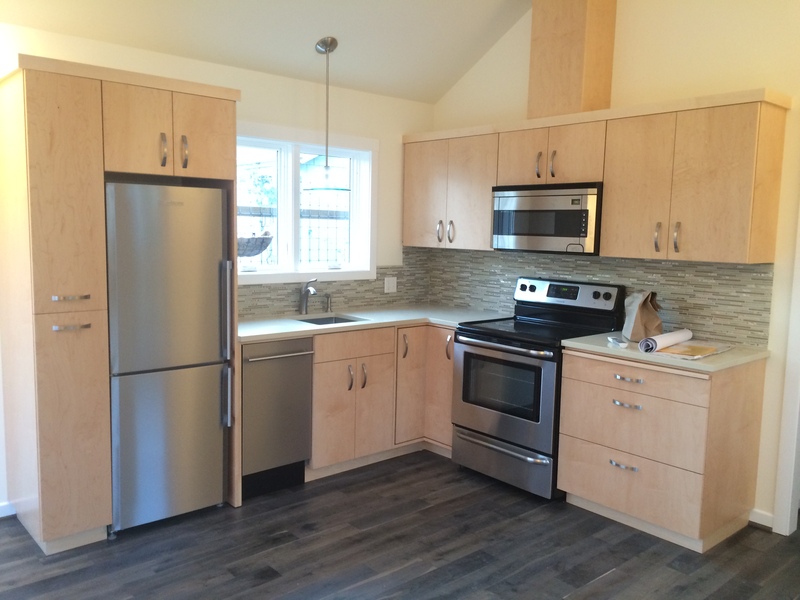 When the permits, design fees, and appliances are added in, the cost comes up to $150,000. 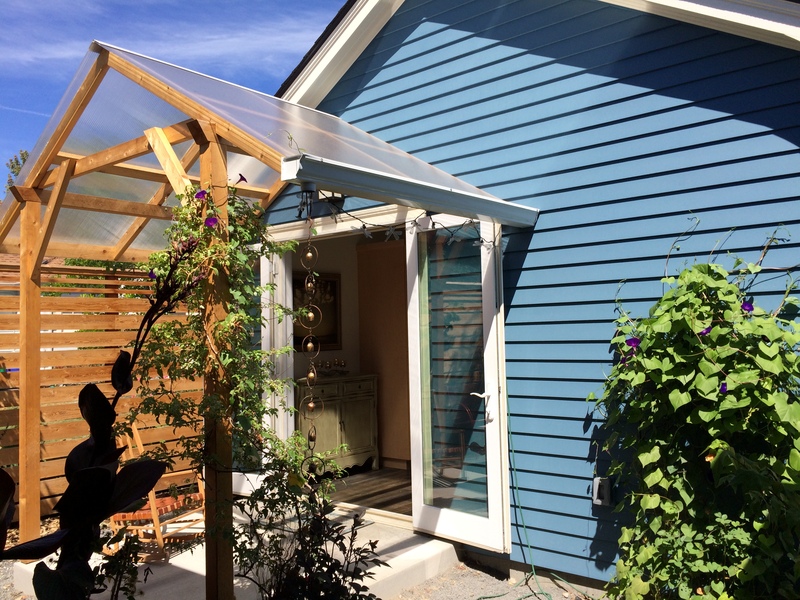 Nancy also remodeled her studio and dramatically changed her landscaping, so her overall project cost was closer to $165,000, though some of that cost wasn’t directly related to the ADU. She worked with Confluence Design-Build to create plans for the ADU and then construct the building. Nancy already had a 200 square foot studio in her backyard, so as they explored design options, she considered adding a wing onto the studio to create a living space for her mom. However, the studio was an older accessory structure which was constructed close to the property line. She discovered that if they extended the footprint of her existing accessory structure she would have to comply with new zoning code regulations which would require her to create a 5-foot setback from the property line. They ultimately decided this wasn’t going to work as well as creating a separate detached structure. They reconfigured the studio to accommodate the ADU, making it slightly smaller. Many Portland lots wouldn’t accommodate two detached structures, but Nancy’s lot is slightly larger than a typical lot. However, the lot wasn’t large enough to contain three structures and two giant trees. Nancy explains that they originally tried to design around the mature trees in the yard, but realized it wasn’t feasible. 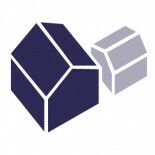 Portland had a requirement that a detached ADU match the look of the primary dwelling (though this changed for detached ADUs within certain size restrictions when the Accessory Structures Zoning Code Update Passed), so Confluence Design-Build designed Nancy’s ADU to match the primary dwelling and the studio. All three buildings have the same siding, windows, and color scheme. However, if they’d had more flexibility, they probably would have gone a different route. As the design developed, a primary consideration was making the small space feel larger. 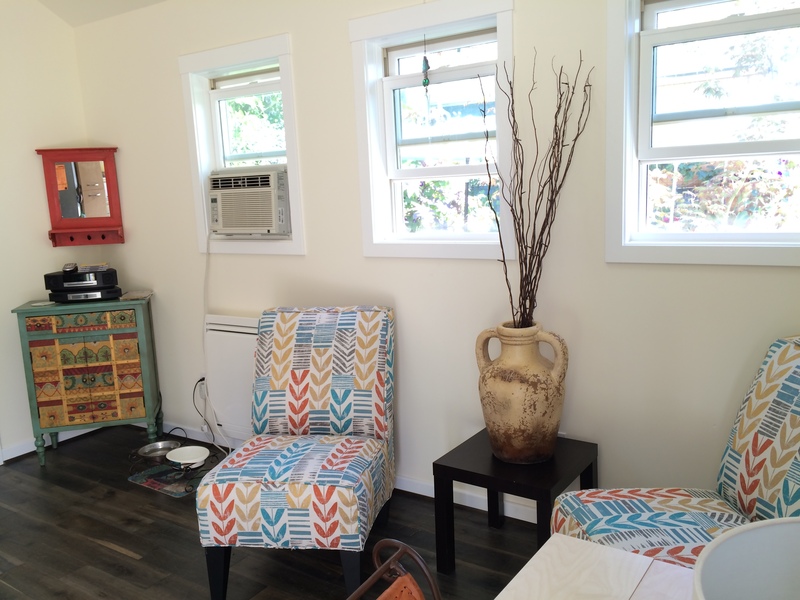 The ADU includes lots of light and high ceilings to provide a sense of space and airiness. Aging-in-place was also a key design consideration. Nancy says it was exciting when they broke ground on the ADU, but the highlight of the build was seeing the finishes installed. Painting, countertops, and floors were key milestones. Nancy loves the floors, an engineered oak with a distressed finish and a dark stain, and the way they contrast with the light maple cabinets. 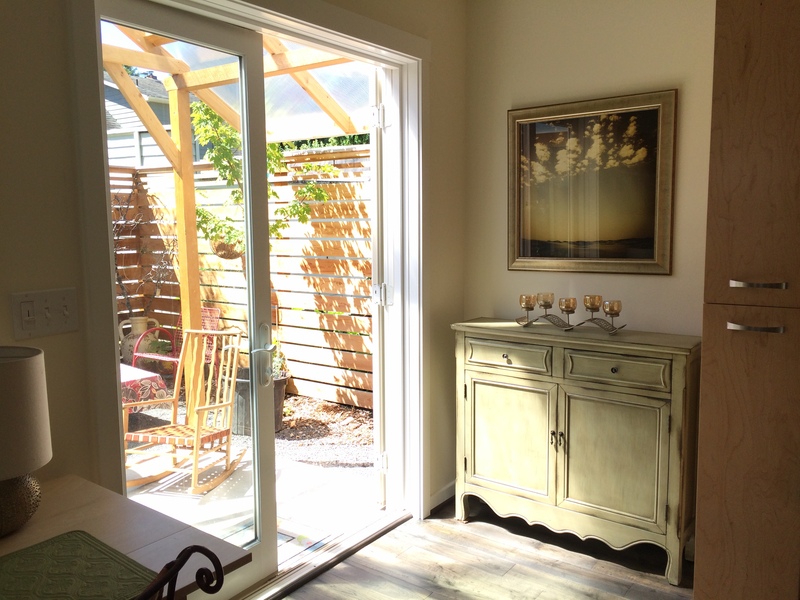 One of her favorite features of the ADU is the little enclosed patio area that was created. Before her mother moved in, Nancy was worried about sufficient storage space. Nancy says if she had it to do over again, she would have spent more time on the design. Specifically, she would have taken the time to ensure she really understood the implications of various design choices. 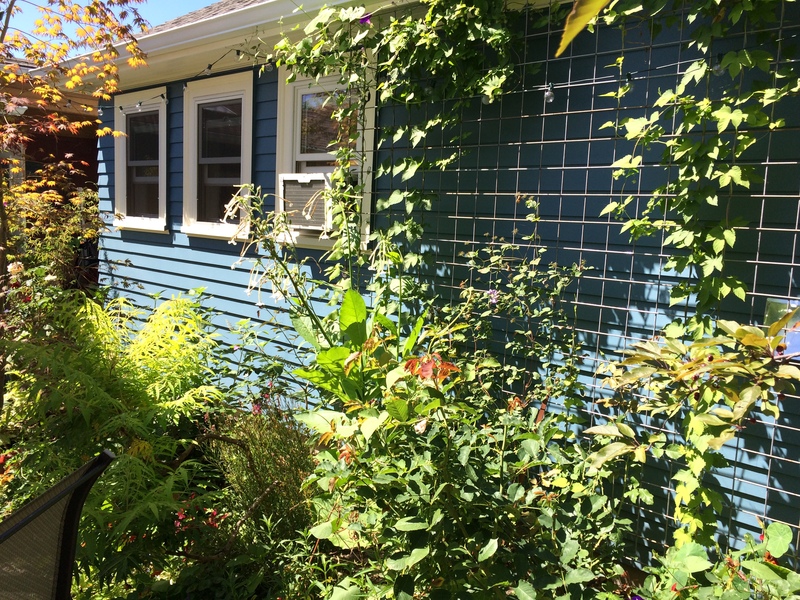 So what advice does Nancy have for homeowners considering creating an ADU on their own property? 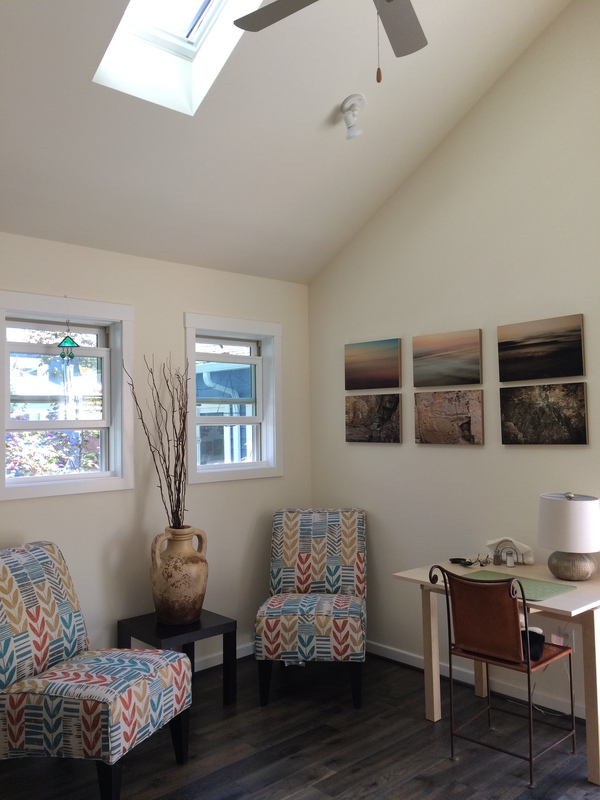 This entry was posted on January 29, 2016 by linamenard in 400-599 SF, Aging-in-Place, Case Study, Detached, Multigenerational, New Construction, Projects, Wheelchair Accessible and tagged 1-story ADU, ADU for aging in place, ADU for family, adu for parent, aging-in-place, Confluence Design-Build, landscaping around ADU, Maggie Abens, multi-generational housing, multigenerational housing, Nancy Abens, Scott Bailey.